Hail and well met! We are the Figures in the Fog and today we’ll be reviewing the new cards for Ashes: Rise of the Phoenixborn, added in The Ghost Guardian. This is the first entry in this series. It’s rude to keep a woman waiting, so allow us to introduce Rimea Careworn, the Phoenixborn of Shadowreck. Rimea enters the fray with 20 Life, 4 Battlefield, and 5 Spellboard. This statline is very similar to Lulu, with a high Life total, and a limited Battlefield. However, that is really where the similarities between the two Phoenixborn end. 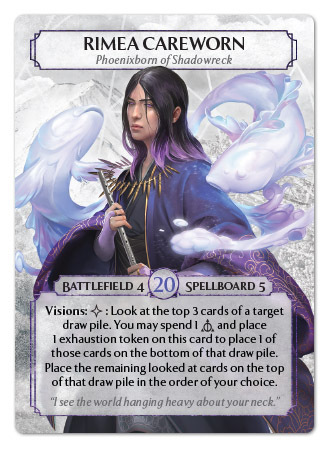 Rimea’s Phoenixborn ability is called Visions. For the incredibly low cost of just a Side Action, Rimea can look at the top 3 cards of either player’s Draw Pile., and can put those cards back in ANY order. And if that wasn’t good enough, if she exhausts herself and spends 1 basic die, she can select one of those cards and place it on bottom of that player’s Draw Pile. On the surface this Ability seems mediocre, at best, until you realize all of the implications of this Ability. If Rimea suspects her opponent is going to need to meditate next turn, she can decide what cards they draw. If an opponent has a Hand Tricks in their discard pile, Rimea can decide what card they discard to recur their Hand Tricks, and what card they draw if they play it. Or it can be used offensively, to manipulate what cards she is going to draw or meditate. This represents an unprecedented amount of influence that a single player can have over influencing future rounds of the game. X: Rimea looks like a very good defensive Phoenixborn, similar to what Saria should be. The biggest problem with Heart’s Pull is that the power of the Ability is incredibly high variance. Yeah, you get a card and your opponent mills a card, but there’s no guarantee that you can use the card you drew, or that the card you took away from your opponent is any good. Rimea solves that problem by letting you see what’s coming, and plan accordingly. This strengthens draw effects, mill effects, and dice manipulation effects. That being said, I think that most Rimea decks will use at least a little Sympathy magic, either for the draw effects, like Changing Winds or Summon Squall Stallion, or for the dice manipulation: Magic Syphon or Transmute Magic. N: This is the first ability in Ashes that can be used over and over with no cost and wow, it’s good. The great draw and mill synergies aside, unless you decide to send one of the cards to the bottom, Rimea will reliable be able to know more than half of the opponent’s hand each round, that can be pretty significant. Rimea’s signature card is a very interesting looking Ally called Ancestral Army. Ancestral Army costs a Main Action and 3 basic dice to play. In exchange, she gets a 3 Attack, 3 Life, 0 Recover Unit with 2 new inexhaustible Abilities: Dauntless and Inviolable. Dauntless says that if Ancestral Army takes combat damage, an exhaustion counter can be removed from it at the end of the battle. This Ability is effectively an inexhaustible version of Gobi Sunshield, where this Unit can counter without being exhausted, as long it takes damage during the battle. On the one hand, it doesn’t get free damage against attacking Units with 0 attack. On the other hand, it doesn’t have the same vulnerabilities to Choke and Freeze that Gobi Sunshield does. And then there’s Inviolable, which protects this Unit from both spells and alterations. Inviolable is an incredible defensive ability, that makes Ancestral Army very difficult to remove, but it comes at a cost. Unlike other defensive abilities, like Unbreakable, Impenetrable, or Spell Guard, it blocks spells and alterations from both players. Ancestral Army is quite the formidable Ally for Rimea and may prove to be an essential tool for her success. The biggest strength of Ancestral Army is its difficulty to destroy and its ability to efficiently deal with multiple weaker Units. 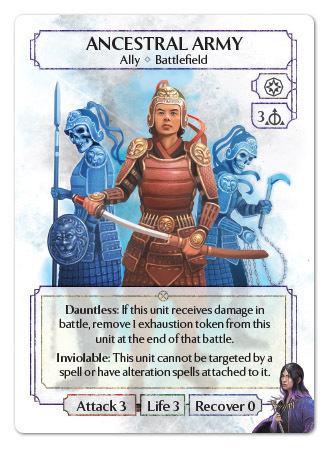 Unfortunately, without Recover and being immune to friendly alterations, like Devotion or even Undying Heart, Ancestral Army is vulnerable to exhaustive abilities like Beguile or Increase Gravity. This really compounds the problem with high cost Allies, which is getting value out of them in multiple rounds. With the inability to pad Ancestral Army’s Life total, Rimea’s opponent has multiple opportunities to mitigate the power of the her signature card. X: I am a little worried about the viability of Ancestral Army. Ashes doesn’t have a great track record for signature Allies: Blackcloud Ninja, Gobi Sunshield, and Rayward Knight don’t see frequent competitive play. That being said, I think Ancestral Army is a bit better positioned than the others. It’s fairly costed, and is less likely to be efficiently dealt with by an opponent. Only time will tell for the fate of this card, I hope it ends up being decent, and can break the curse of signature Allies. N: Ancestral Army will, I think, really help to keep Rimea viable even at her low battlefield. I suspect it will be used most to trade with the Aftershock bros, which is alright. Magic Purity makes that trade even better, however and Rimea definitely has the Spellboard for it. That appears to be all the information we can offer for now. PHG should be releasing more information regarding other tricks that Rimea will be bringing with her this coming Thursday. But while you wait, what do you think about Rimea and the Ancestral Army? Are you excited to see the new mechanics for Rimea, or are you dreading a world where you never get to play another Illusionary Cycle or Harvest Soul, after round one? Tell us in the comments below, and feel free to spread the word amongst your friends on social media. Unfortunately our time is up for today, and we must Fade Away again, but the Figures in the Fog will return.